I just wanted to check in and say hello…I’ve loved keeping up with your blog, Sherry, you are so eloquent; however, I cannot help you in the least because I’ve NEVER been on a cruise. I hope to change that sometime soon (with some type of Disney Cruise, of course). Hope you are enjoying the last few weeks of summer! Stefanie-I actually went hunting several months ago to try and find you email but no luck! Imagine my excitement to see your comment. So yeah-we are back in touch! And thanks for the kind words-it’s nice to know people are out there actually looking at the blog! 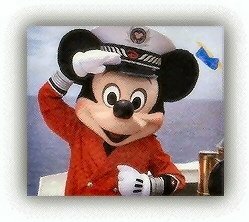 I have no experience with a Disney Cruise, but I do have a quick comment about souvenirs. Once after a trip to Disney, I thought “Oh shoot, I should’ve gotten that leather bound scrap book”. I found a phone number for Disney Merchandising (I think in the Passporter) and called. I found out you can place a phone order for any item at any Disney owned store through that number. The item I wanted turned out to be on sale and I actually saved $$.